Successfully Added Senior Citizen Cell Phone (Worldwide Quad Band GSM) to your Shopping Cart. Just what the doctor ordered - An easy to use and practical cell phone that is specially designed for senior citizens! Tired of those small phones with dial buttons so small that unless you have pencil fingers you can't make a call? Not exactly user friendly for people with arthritis, rheumatism, or poor eyesight right? In contrast, this Senior Citizen Cell Phone has jumbo sized keys which make dialing phone calls nice and easy! Now for the beautiful part: This Senior Citizen Cell Phone comes with an SOS button on the back of the phone that you preset with an emergency number of your choice. When you need it, a quick press and you'll be connected with your spouse, your children, your doctor, or whatever emergency contact person you designate. As for regular phone functions, this Senior Citizen Cell Phone also delivers in style. You get an attractive and light mobile phone with a brightly lit screen. Both icons and buttons are nice and big, which makes the navigating the phone a breeze. It can store 500 contacts and is unlocked so you can use it with any cell phone provider you choose. Basically, this Senior Citizen Cell Phone is great for first time cell phone users or people generally intimidated by technology, thus making it the perfect gift for parents or grandparents. 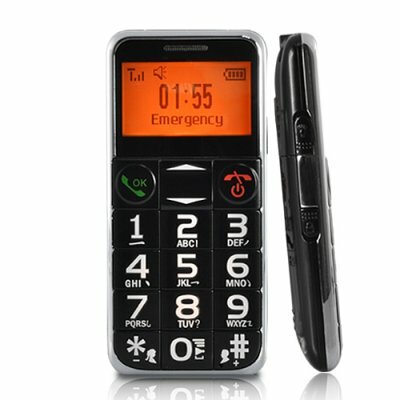 This exclusive Senior Citizen Cell Phone is now available for single or bulk purchase, from the direct from China wholesale electronics leader - Chinavasion.